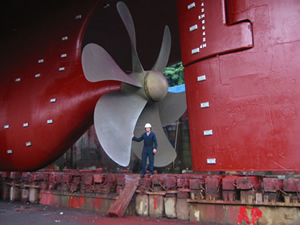 A propeller makes an aircraft, ship, or submarine in water or air go by making a big wind or a strong stream. It does this by turning two or more wings very quick. 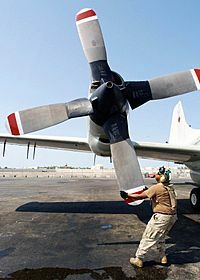 The blades of a propeller act as rotating wings, and produce force through application of both Bernoulli's principle and Newton's third law, generating a difference in pressure between the forward and rear surfaces of the airfoil-shaped blades. A replica of SS Great Britain's first propeller was recreated for the museum ship. It was replaced with a four-bladed model in 1845. The SS Great Britain was initially designed to have paddles but was substituted after screw propellers were proven to be more effective and efficient. Propeller Facts for Kids. Kiddle Encyclopedia.